The Regulating for Decent Work (RDW) network organizes its conference every two years. The next RDW Conference will be held in Geneva from 8–10 July 2019. Please refer to the navigation bar on the right to access the individual conferences. The aim of the Regulating for Decent Work (RDW) project is to develop a coherent response to the arguments against labour laws that have dominated employment policy in recent years. It also aims to advance research and policy directions tailored towards making labour market regulation more effective. To this end, it questions whether the goal of improving working life can be advanced through legal regulation, and whether carefully designed labour regulations and enforcement mechanisms, rather than a retreat from labour laws, may be a more promising avenue for future social and economic progress. RDW is a collaboration between researchers at the International Labour Organization (ILO), the University of Amsterdam’s Amsterdam Institute for Labour Studies / Hugo Sinzheimer Instituut (AIAS-HSI), the University of Melbourne’s Centre for Employment and Labour Relations Law (CELRL), Jawaharlal Nehru University’s Centre for Informal Sector and Labour Studies (CISLS), the University of Durham’s Law School (DLS), the Cornell University’s ILR School, the University of Duisburg-Essen’s Institut Arbeit und Qualifikation (IAQ), the Institute for Applied Economic Research (IPEA), the Korea Labor Institute (KLI), the University of Manchester’s Work and Equalities Institute (WEI), and academic and policy institutions from across the world. The network is interdisciplinary and involves researchers from a range of fields including economics, law, sociology, development studies, industrial relations and geography. to make available to as wide as possible an audience a principled and coherent argument for retaining and advancing labour rights in the globalized economy. 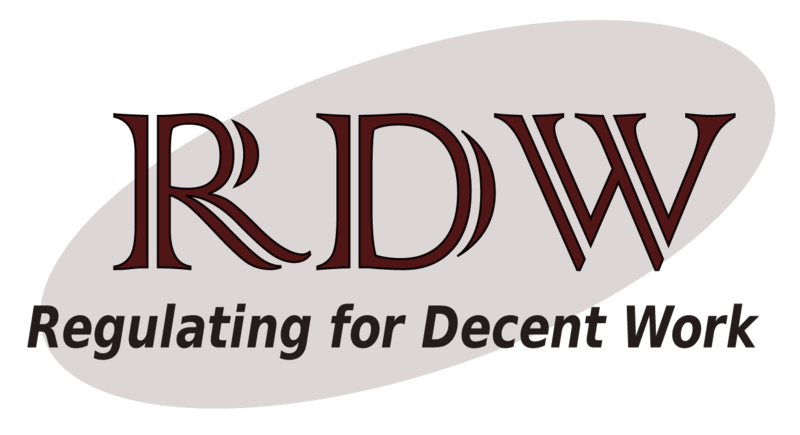 If you are conducting research in line with the objectives of the RDW network and would like it to be made available or listed on this site, please let us know.